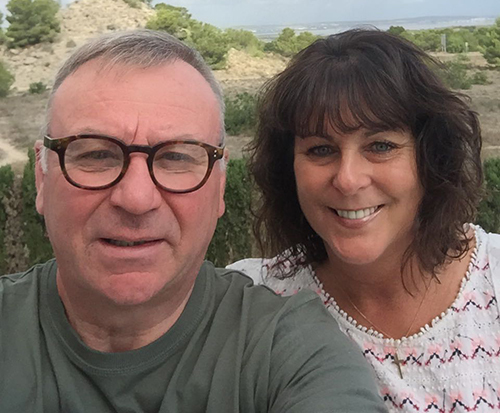 Peter and Susan Salt’s dream of retiring to Spain will soon become reality, thanks to HomeEspaña finding them their perfect home in the Costa Blanca. The Northants couple got the keys to their one-bedroom apartment on an urbanisation in Orihuela Costa in April 2017. Their plan is to use it as a second home for a couple of years before retiring there. The Salts found their property, which is part of the Eagle’s Nest urbanisation on the edge of Villamartín, during a viewing trip to Spain in February 2017. After buying their apartment, the Salts redecorated throughout, changed the kitchen and bathroom, to which they added a walk-in shower, changed the tiles, removed the fitted wardrobes and upgraded the lighting. They returned in September 2017 to finish furnishing. The Salts’ apartment is on the first floor of a two-storey block. It has a balcony, views of the sea as well as the area’s famous salt lakes, and comes with access to four communal pools. They’re a 25-minute walk from Villamartín Plaza and in the other direction, they can walk across a nature reserve to San Miguel de Salinas. The apartment is located in a quiet spot and not overlooked, meaning they don’t get noise from people in the pool. Reaching Orihuela Costa from the UK is simple. It is only 20 minutes’ drive from Murcia San Javier airport or 45 minutes from Alicante airport, which receives flights from a number of UK regional airports and all over Europe.